Security and linking to other on-site databases are two strengths of premise-based software. Content at the Hyatt Regency Chicago focuses on the guest experience and can automatically react to individual guest’s preferences and information requirements. Software as a Service (SaaS) models have become popular in the past few years with customers looking to reduce the cost and complexity of their digital signage installation. At first glance, the SaaS model appears attractive because it eliminates the need to purchase and maintain servers that support the network and it replaces the initial software purchase with an ongoing service charge, not unlike a mobile phone or cable plan. By contrast, a premise-based product is software that is purchased (or leased) and operates within the user’s organization, preferably integrated into the company’s existing infrastructure. Most premise-based software is server based, using thin or rich clients to play content. SaaS pricing models vary by supplier; in some cases player PCs and displays need to be purchased, in others it is part of your monthly charge, while others are the same premise-based client/server applications that you might purchase, just managed and branded by a third party. SaaS is not necessarily a product, but rather it is a delivery model that has both benefits and drawbacks. There are applications where SaaS makes sense and many others where it is simply impractical, or lacking in rich content datamining potential — and a premisebased solution is the better choice. One analogy for the SaaS vs. premisebased models is comparing public and private transportation. If you live in the city and need to commute to work each day, you might take a bus back and forth. You don’t have to buy or maintain a car; you can pay as you go for a defined service. The transit authority is responsible for maintaining the buses, putting fuel in them, and providing a driver for your trip. You go where the bus takes you according to their schedule. On the other hand, owning a car gives you much more flexibility over where you live, when you travel, and where you go. Although you need to purchase and maintain a vehicle, you have complete control over your transportation and can tailor it around your specific needs. Like most things in life, the decision between SaaS and premise-based comes down to a tradeoff in priorities — if you want greater flexibility and control, you need to invest in the proper solution. If you can live with a general solution that caters to a broad base of requirements, then a shared network might be sufficient. In many ways, the term digital signage is a misnomer that undervalues the contribution that this technology can provide to an organization. Digital signage is a form of visual communication, providing key information to a specific audience, at the point of decision. Digital signage allows you to portray information graphically using images, tables, video, and animation to enhance understanding. It can inform, educate, build awareness, create relationships, and enable decisions. Effective retail digital signage can respond to the customer with dynamic content that is integrated with the retailer’s central point of sale system. A retailer can get much greater value from their digital signage system by integrating it with their POS system, but that is unlikely to happen if the digital signage system is hosted by a third party. To achieve the most benefit from your system, each message must resonate with individual viewers to facilitate an appropriate action. Digital signage can do much more than just post a message; it can frame the context of the message. The more targeted the message, the higher the impact on the audience and greater value back to the originator. This is a key reason why anyone should deploy digital signage. People make lots of decisions every day. Every business has a wealth of proprietary data; their challenge is making that information actionable. 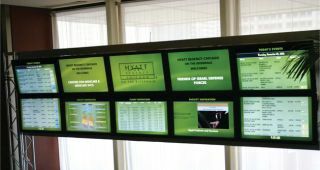 Digital signage is a great vehicle to connect people with the information they need, when they need it, and in a format that is easy for them to understand. With the right digital signage system, you can engage people through immediate feedback to their actions. If all you want to do is greet visitors in your reception area or entertain them while they wait, SaaS might be the right model for you. If you want to motivate your staff with their performance against targets or indicate what meeting is in which room based on your meeting room scheduling software, then a premise- based product would be a much better solution, because it can tap into other databases on-site and work in harmony with them to create targeted messaging, even environmentally cued messaging. Uploading real-time data from your business to an externally hosted digital signage system is not practical for several reasons. First and foremost, it is a potential security threat to your internal network. When your data is in the cloud, you never know where it is actually located or who has access to it. In fact, you don’t know what country it is in or if it is being backed up somewhere else. Many hosting services retain rights to all information on their network, so your intellectual property may no longer be yours when you allow someone else to host it. Depending on the information, allowing a third party access to it could conflict with privacy and regulatory compliance requirements. Information is the lifeblood of any business and often a key strategic advantage. A retailer can get much greater value from their digital signage system by integrating it with their POS system, but that is unlikely to happen if the digital signage system is hosted by a third party. My bank can see my checking account and all of my credit card transactions and the Federal government has access to my tax forms, but I don’t have much control over either and have to trust them to act responsibly. Data security and privacy on the internet is challenging enough, but what happens if your vendor (who you have entrusted with the keys to your success) is sold to someone less scrupulous? When you outsource the network, you rely on your vendor to provide adequate bandwidth, uptime, and security to support your needs. If the interface to your vendor is through your browser, every interaction you have to update or schedule content will be limited to the speed of your connection and their servers. If your internet access or your vendor’s network goes down, you lose access to your system and your players will stop updating. SaaS requires a leap of faith on the part of the customer, who is completely at the mercy of his/her vendor. If that vendor goes bankrupt, the screens will go blank and no one will be able to touch them until ownership issues are resolved. SaaS is a business model that relies on long-term supplier viability. If your vendor fails or changes strategy, you are on your own. In the case of premise-based software, your network can continue to run for years regardless of what your vendor does. I balance my accounts every month with a copy of Microsoft Money that I purchased in 2004. Since then, Microsoft moved the product to an online only version and later discontinued the product altogether. The copy I bought five years ago continues to work just fine. Digital signage is not a one-size-fits-all proposition. You should consider your specific requirements and the level of control and integration you need when selecting a software model. If your needs are basic, your requirements to integrate with internal systems are low, and your budget is restricted, then SaaS may be the right solution. On the other hand, if your display network is integrated with vital data to deliver real business value that is essential to your operations, then a premise-based solution may be a better option. For system integrators, selling SaaS is like selling a projector; the product is clearly defined, and easy to order and install. The value add by the integrator is minimal, and the margins often reflect that effort. If a customer has very simple needs, then SaaS may be the way to go. If a customer has specific goals to enhance their business and lower costs through targeted communications, then a premise-based solution is probably more applicable. System integrators can add significant value to their customer’s business when they provide an engineered solution built around the customer’s needs. Offering a shared resource is a compromise that reduces value and does little to distinguish your solution from others. There is a broad range of digital signage offerings on the market, and customers need to understand their options and expectations. Product capabilities vary significantly from one supplier to another, so a good SaaS provider, running a solid product, might offer a superior solution when compared to a weak premise-based product. There is a place for both SaaS and premise-based software solutions in this market. It is not a case of one replacing the other, but rather the appropriate model should be selected to best meet the customer’s needs. As president of Omnivex Corporation, Jeff Collard (collard@omnivex.com) leads Omnivex’s sales and marketing activities as well as relationships with its business partners. Jeff holds a degree in Engineering, has authored numerous articles on digital signage, and travels extensively throughout the world speaking at industry seminars. Omnivex has been a leader in software development for digital signage since 1991.